Between my farm box, dad’s garden, and sister’s garden, we’ve been having a zucchini situation lately as in it’s everywhere! We can’t use/unload it fast enough. For lunch, I spiralized one and served with raw corn, chopped heirloom tomato, and a fast dressing I threw together of hummus, tahini, lemon juice, nutritional yeast, and water. It looks odd, but it was actually great topped with shredded Cheddar Vegan Gourmet and black pepper. 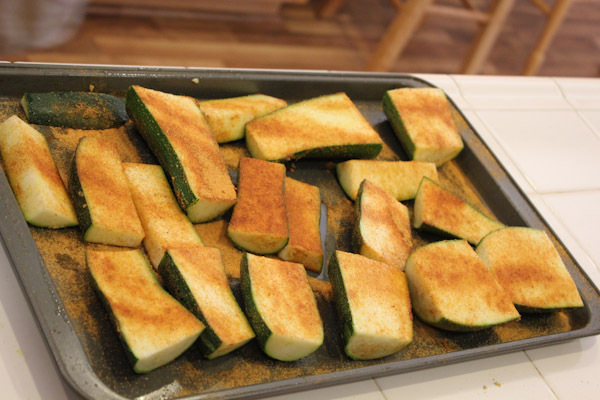 Then I got more zucchini at a last minute family dinner gathering at my sister’s house. This time we tossed big chunks with olive oil and sprinkled with Lawry’s Seasoned Salt and grilled for about 10 minutes. 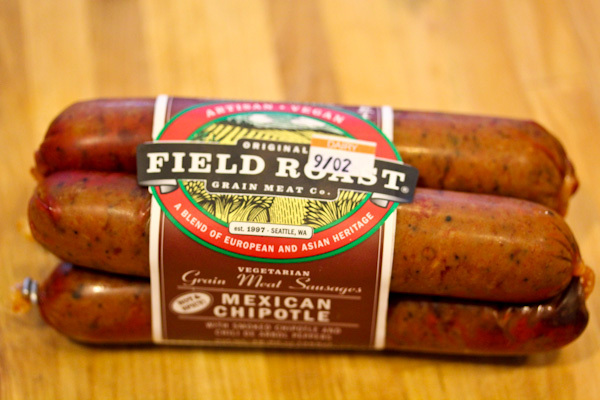 Since they were grilling sausages, I brought my own to throw in the grill – Field Roast’s Mexican Chipotle vegan sausages. 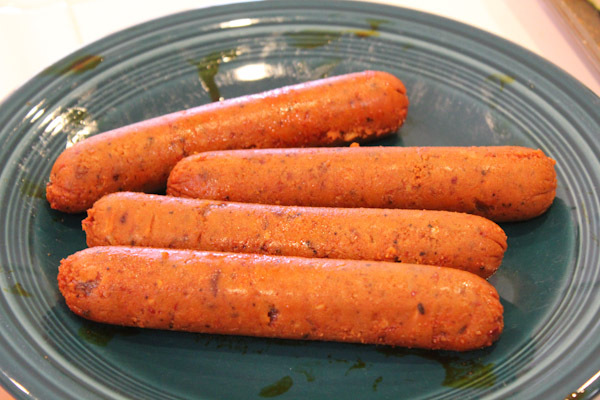 I compared the nutrition facts on these with some of the meat sausages and the Field Roast sausages actually had more protein, way less fat, and less calories than the meat sausages. Plus fiber and no cholesterol, of course. 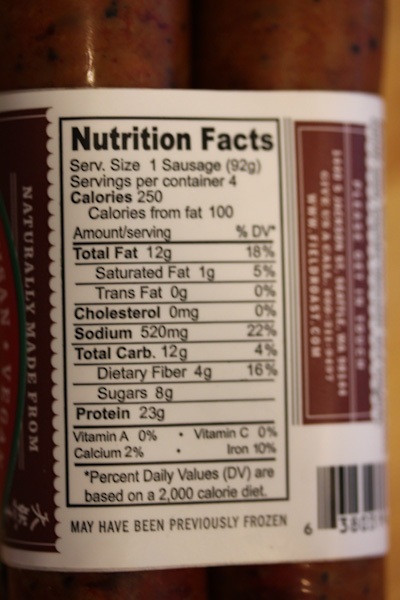 Wow, 23 grams of protein per sausage! The meat ones had about 13 grams per. Removing the plastic casing from the sausages was a bit of a hassle carefully slicing with a knife while not cutting the sausage. Since they’re pre-cooked, they only need to be heated up and took a lot less time on the grill. 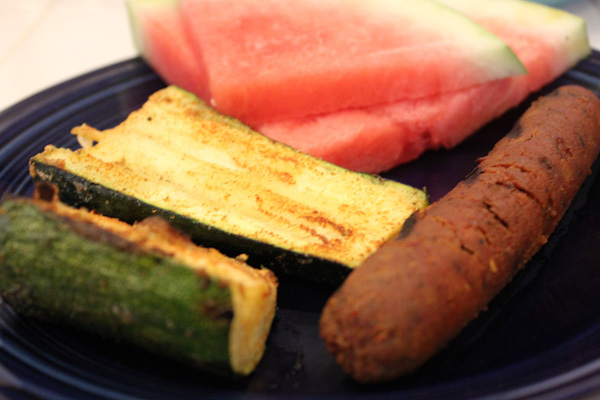 I had to bring my favorite summer food to go with dinner also and ninja sliced it while the sausages were grilling. The Field Roast sausages held together okay on the grill, and I got my sisters and hubby to try them with me for opinions. We were very surprised at how spicy they were, almost too spicy for even me and that’s saying a lot! The texture was a little dry and crumbly, like a bean burger. But they were also hearty and not too chewy or rubbery. 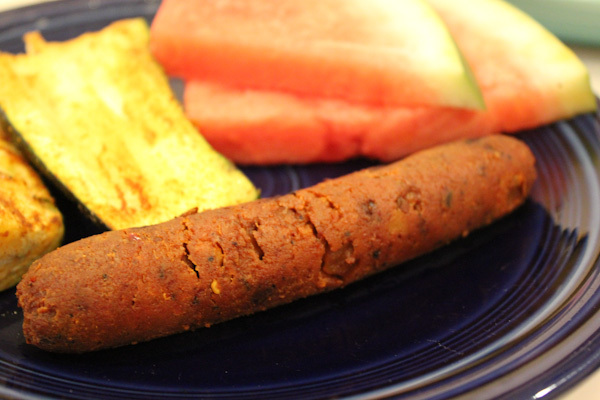 They did not seem like fake meat, a plus for me, but more like a grain sausage with veggies mixed in for a nice texture. They would slice or crumple well into recipes, but the spiciness on the Mexican Chipotle flavor was almost too much heat to eat by itself. We agreed they would be perfect crumpled into a vegan jambalaya. Or crumpled over a salad for extra kick and protein. The sausages weren’t cheap, nearly $5 for four. But worth it and something I’ll grab again for special occasions, but maybe a less spicy flavor. Cute story about your niece! I am not a fan of sausage or burgers so would take a pass personally on these but I bet Scott would love them! I love the big, chunky!! hunks of roasted zuke. 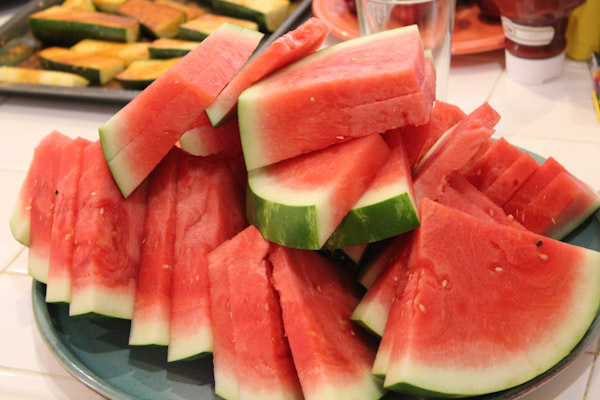 That’s how I like my zuke pieces…big. The little tiny pieces shrivel and turn into mush. Yours look perfect! He probably would, they were super spicy! Almost got those same sausages a few weeks ago, just didn’t want to spend so much. But maybe now I’ll try them for a special occasion. I’ve been eye-balling them for months at Whole Foods, but passing over because of the price too. I just bought a spiralizer (inspired by your blog!) and tried it for the first time tonight (love!!!). 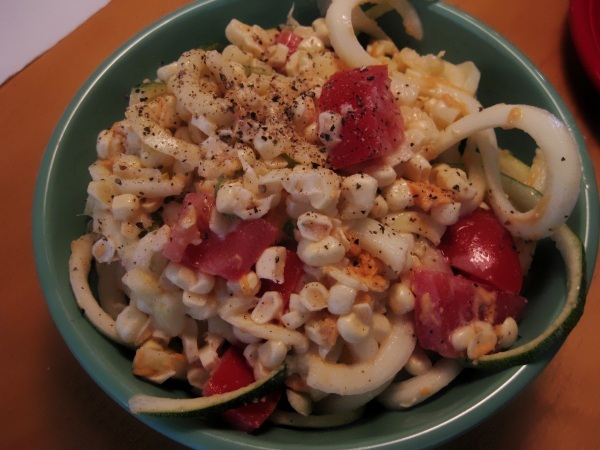 I’m excited to make more dishes using the spiralized zucchini and your salad with corn and hummus dressing is excellent. Aw, thanks on the spiralizer! :-) They’re wonderful for butternut squash, cucumbers, radishes, turnips, and carrots. I’m still perfecting making baked curly fries though!